More people today have flexible work schedules or choose to use their home as their office. And why not? With a myriad of options to get online and stay connected, working from home is a benefit of modern technology. The hard part, however, is deciding where in your house is the best place to set up shop when you don't have a dedicated room in which to toil away. Thanks to more homes being open concept, it can be entirely possible and thoroughly practical to establish your personal office right in the kitchen. Enabling the flow of energy and light between several rooms in the home is reminiscent of large loft apartments in big cities like L.A. and New York. As old factory floors were renovated into apartment, some chose to keep the expanse of space for a minimalist, modern feel. Dwell featured the work of one architect whose kitchen renovation project involved using the space in a Soho loft to unify a kitchen fit for a chef and a multimedia office space. The space was divided by a sleek, black kitchen island in which the stove had been seamlessly incorporated. An office in your kitchen can be practical and improve the flow of your home. When sitting at a desk, it can be all too tempting to slouch over a computer keyboard during the day. Some people find that working standing up is better for their body and posture. 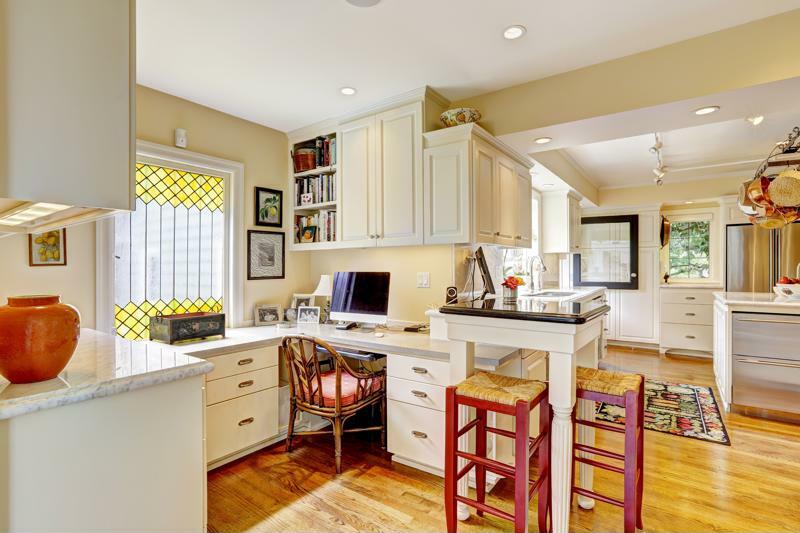 As a result, the kitchen could be the ideal place for a standing desk. If you don't have room for an actual desk, This Old House advised creating a stand-up message center in the corner of the room. In this example, its surface is of the same material as the rest of the kitchen countertop, yet the backsplash is made of cork board so messages and notes can be tacked up. Below the workspace, the homeowner added kitchen cabinets so storage room was not sacrificed. To give the area an office-like feel, bookshelves were added above the space to store cookbooks and also binders and other work-related items. The kitchen island is not the only way to separate the kitchen from the office. Like the example outlined on Modspace, you can install additional kitchen cabinets to create a wall. The homeowner's desk is right in the kitchen, but thanks to two stacked cabinets that jut out slightly, the furniture can be placed in what essentially is a recessed nook. To conceal the work area, the surface matches the countertop and the desk drawers are the same material and style as the cabinetry. You can't really see the space unless you look for it, which can be an option for those who want a smooth aesthetic and seamless flow from kitchen to home office. Creating a place to work in the kitchen provides the opportunity to multitask throughout the day, which can be helpful for those who have equally hectic personal and work lives. Some people also feel that the kitchen is the center of the home and it is helpful to be working right where everything is happening. However you choose to incorporate your office into your kitchen – and if you even make that decision! – talk to the professionals at a Kitchen & Bath showroom to discover your options and how to create the right kind of environment.